Depending upon your design aesthetic, if you’re like me, mixing and matching antiques and vintage items with functional, soft items, sometimes more modern items is a wonderful way of welcoming stories from the past as well as personality from the present to create a signature decor style within our homes. 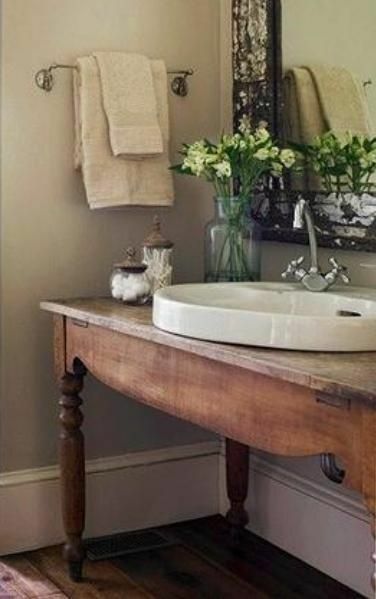 In this bathroom remodel, a French antique console has been converted into a bathroom vanity – brilliant! You can view the entire bathroom here, but this is the piece that caught my eye. After all, when you find a piece of beautiful antique furniture, you can be confident it is unique, signature and designed to fit perfectly into your preferred space. Certainly an idea worth keeping in mind especially during those times when you don’t know where to place a beautiful console you discover. Now you have one more place to situate it as you welcome it home. ~View more Decor Inspiration posts here in TSLL’s Archives.